Mary Jane Faulkner (James, Samuel, William) was born in Wallkill, Orange Co, New York , January 11th 1814, to parents Col James Faulkner and his wife Martha McBride. Mary Jane married widower Josiah Robinson Sloat, Sr (b. 1805 d. 1862) on April 5th 1842 in Jackson, Michigan. Mary Jane was also step mother to Charles A Sloat, Josiah's son by his first marriage. Mary Jane Faulkner had come to Grass Lake, Jackson Co, MI with her parents and siblings in 1834. 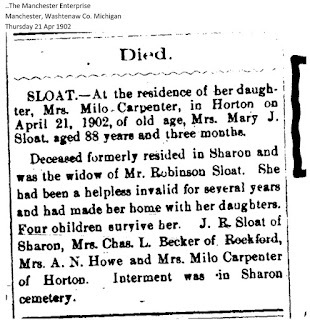 Josiah Sloat had come to Sharon Twp, Washtenaw Co, MI in 1831 with his parents and siblings. Both families were originally from Orange Co, New York. The proximity of the family farms was close, Grass Lake road today runs right into Sharon Twp. 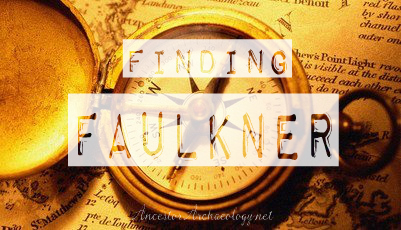 Mary Jane Faulkner was Presbyterian and may have met Josiah in church, or may have met him in town, her father owning the first hotel in the county. Mary Jane Faulkner Sloat died April 21st 1902 at the advanced age of 88 years. She is buried in Sharon Township Cemetery in Washtenaw County, MI. 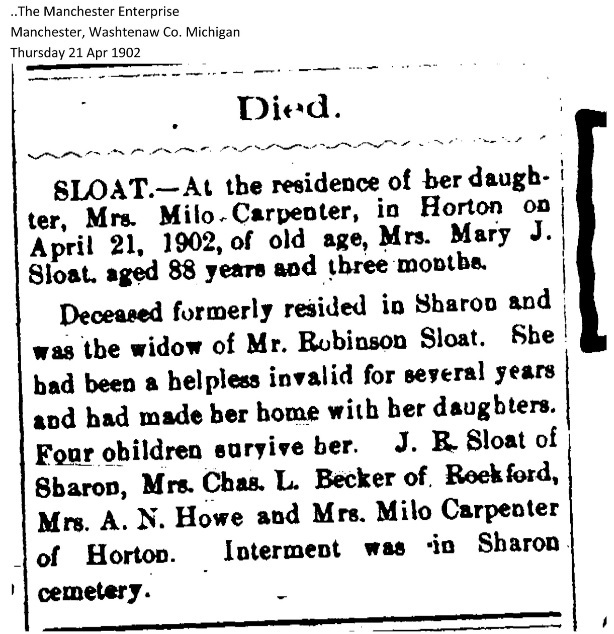 Her husband Josiah Sloat died March 5th 1862, his burial is unknown.